Do you know your spring peepers from your wood frogs? Have a passion for weather? 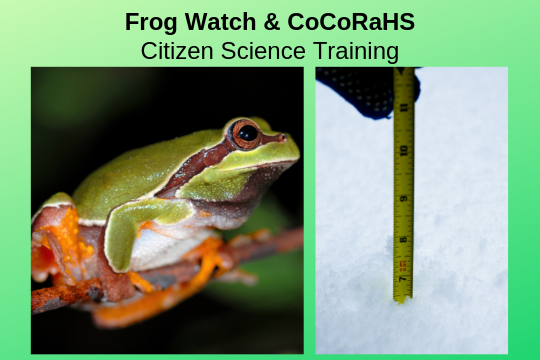 Hop on over to GSWA Headquarters for this dual, hands-on citizen science program training session where you can become an official FrogWatch and/or CoCoRaHS neighborhood volunteer. Eric Jackson, Environmental Educator at Hartshorn Arboretum, will train you to properly log your frog and toad sightings, which helps establish long-term and large-scale data on amphibian populations. David Robinson of CoCoRaHS (Community Collaborative Rain, Hail and Snow Network) will teach you to measure and map precipitation (rain, hail and snow) joining a network of other backyard weather observers of all ages and backgrounds who do the same in their local communities. This is a free workshop. Registration is required.